Heat oven to 375°F. Place margarine in 9-inch round cake pan. Place in oven for 3 to 4 minutes or until melted. Remove pan from oven; tilt to coat with margarine. Sprinkle brown sugar over margarine. Place 1 pineapple slice in center of pan; place 6 slices around edges. Fill spaces with dried cranberries. Return to oven; bake 6 to 7 minutes or until pineapple is heated. Remove pan from oven. 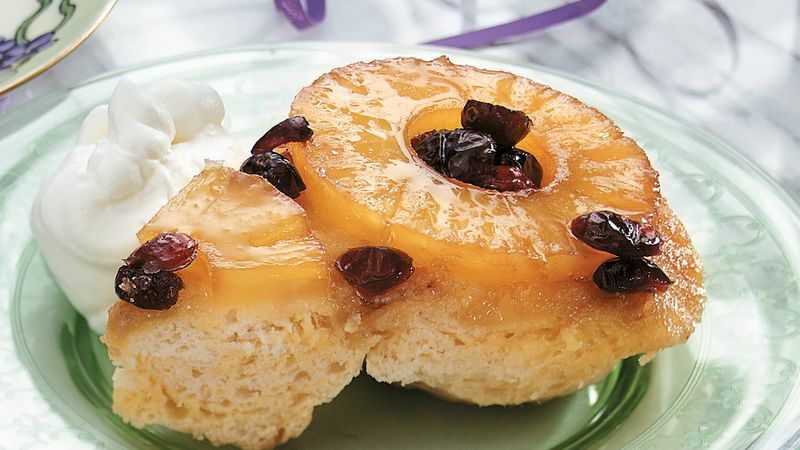 Top each pineapple slice with 1 biscuit. Brush tops of biscuits with reserved pineapple juice. Sprinkle with sugar. Bake at 375°F. for 25 to 30 minutes or until biscuits are deep golden brown and no longer doughy in center. Immediately invert onto serving plate. Spread any topping remaining in pan over biscuits. Cut into wedges. Raisins, chopped dried apricots, sweetened dried cherries or maraschino cherry halves can be substituted for the sweetened dried cranberries in this recipe. Just before serving, embellish each wedge of cake with whipped cream.